Be the Tim Howard of Your FIFA World Cup Celebrations! People around the world invest their full hearts into their team, suddenly becoming united with their neighbors and coworkers as they all cheer for the same thing: the World Cup trophy in the hands of their team. With all the passion fans invest into the World Cup there are going to be conflicts between fans and out of control celebrations, and maybe even language barriers to jump in order to discuss the games. Knowing how to deal with these situations can help to Tim Howard-style “save” your World Cup experience, even if your team falls a little short on the success ladder. Whether watching the games with friends and family, strangers in a bar, or live in the stadium in Brazil (lucky! ), you’re more than likely to encounter someone who is just as invested in their team as you are in yours. When this happens, do not panic; simply remember the skills you learned in the Conflict Styles and Resolution course you watched in order to be able to present your argument on why you believe your team has the better defensive lineup than the opposing team. Not only will your strong negotiating strategies effectively hit home your argument, but you will also impress anyone who’s listening with your communication techniques and how you handled a tense situation. Your negotiation skills might be so great that your opponent agrees with you about your team’s dominance—no guarantees though, the loyalty of some fans is very deeply ingrained in their hearts. Many sports fans enjoy watching the games surrounded by fellow supporters of their team so they can cheer and sympathize with others who are just as passionate. One of the most popular places for such a crowd to gather is a local sports bar, where plentiful TVs make for easy viewing, and a bar makes for fun celebrating and easy wagers (‘If Costa Rica wins the World Cup, I’ll buy you a drink!’). As a bartender, you’ll want to know how to handle customers whose celebrations get a little too out of hand. Once you’ve taken the Serving Alcohol—How to Deal With Intoxicated Persons training course, you will understand how to recognize an intoxicated person and how to effectively interact with them, such as knowing how to refuse alcohol without losing their loyalty or upsetting them. The official language of Brazil is Portuguese, but the official languages of FIFA are English, German, French, and Spanish. But just because there are multiple languages classified as “official languages,” this does not mean that everyone you meet will know all these languages. 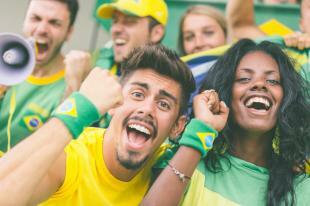 If you’re one of the lucky die-hard fans traveling to Brazil to watch your team play, there’s a high likelihood you will run into some language barriers while eating out, walking the streets, at the game, or souvenir shopping. Having a smartphone can help with translating simple words and phrases, but an even better way to prepare for language differences is to have prepped yourself using the Second Language Basics for Beginners and Beyond training course. Through this course you will discover techniques, online tools, and ways you can use technology to educate yourself in a new language. We hope you’re enjoying the World Cup! We certainly are!